These boots were made for waxing, so that’s just what REV’IT! did. 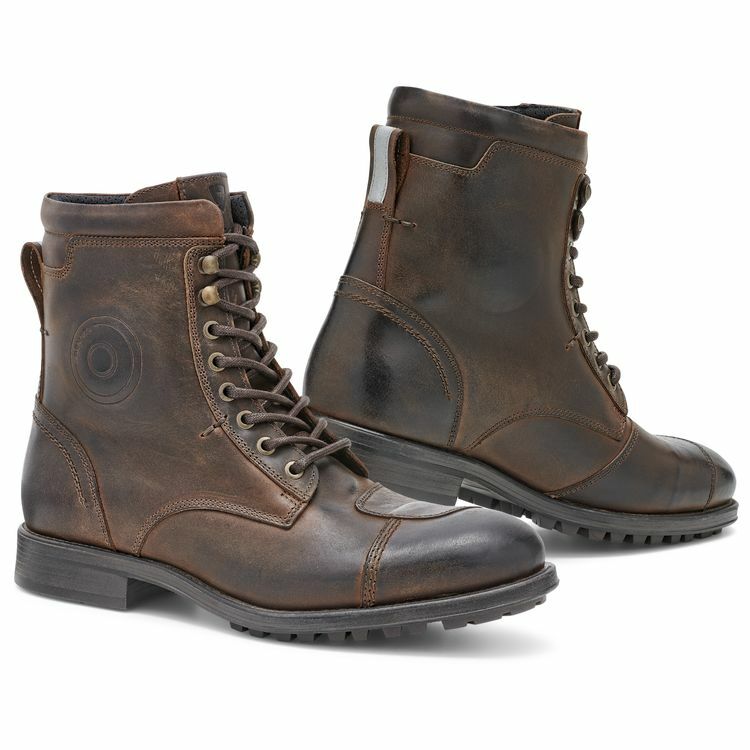 The unique waxed leather finish on the REVIT Marshall Boots not only looks great, but repels water. To enhance the weatherproofing provided by the finish, internal tongue gussets prevent water from coming in through the front closure. The leather capped toe and heel achieve a dual function, adding a designer touch while obscuring anatomically thermoformed heel and toe cups. Decidedly moto features including symmetrical leather shifter panels on both boots and injected discs on either side of each ankle provide additional riding practicality and protection. With the high degree of ergonomic and stylistic attention to detail, the REVIT Marshall Boots are sure to upgrade your ride and your look, both on and off the bike. Style look with decent protection. Are you kidding? Look at these boots ! And added protection with the comfort to wear all day ? I'm in !! They are stylish and so far they are holding up superb! I recommend them! These boots are sized very small. Can you resole these boots? I normally wear a 9.5 size shoes and boots. Does these run small. Can I get away with a size 10? BEST ANSWER: I wear a size 9 1/2 and bought the 42 & 43. They are narrow. I sent the 42 back. I wear a 9 1/2 as well I purchased the 42 and fits perfect. You should go with a size 9. They run slightly big. BEST ANSWER: Zilla says ships late October. It's 10/22...hopefully any day now. I ordered several weeks ago. What's the weight of these boots(Kgs)? Do they come in Tripple E widths? Dont you have size 47? In your REV'IT! Marshall Boots video there was a leather looking shifter cover on your bike. Do you guys sel those? Do these boots have a CE rating? Where are the boots made? BEST ANSWER: The boots aré made in Portugal, has a beautiful finish. Does the leather scuff lighter as it ages, or does it darken? BEST ANSWER: Mine seem to have darkened.